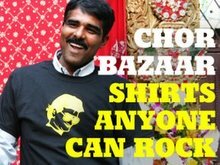 CHOR BAZAAR WORKSHOP: Thanks Nirvair Singh, WTF! "We need back up!..this guy has a towel wrapped around his head"
A fellow co-worker brought this story to my attention. My immediate thought was the racial profiling that was going to occur with this this story. The article is located further down in this post. It is obvious that Nirvair Singh, is a sick man and needs to seek psychotherapy, but the police force and reaction to the situation seems like a bit of an overreaction with 70 Law Enforcement officials! Was Orlando's law enforcement seriously considering this to be a terrorist attack? Where has this country gone? A lunatic walks into a place of business and they call the SWAT team?!?! I guess Orlando's law enforcement could suggest that this was a terrorist training exercise and the guy just happened to be South Asian. It was the perfect opportunity. The promise of a flight to India and the arrival of a taxicab ended a standoff that stalled traffic for three hours Tuesday near the Florida Mall. Nirvair Singh, whom Orange County deputy sheriffs feared might have a bomb, walked out of Wachovia Bank at 2 p.m. with luggage in hand. A SWAT team swarmed Singh, who flailed his arms after dropping his bags. A K-9 bit one arm, and SWAT members forced Singh to the pavement. "The only ride he's going to get now is to the Orange County Jail," said sheriff's spokesman Chief Steve Jones. The standoff began at 10:52 a.m., when Singh, 31, walked into the bank at 7950 S. Orange Blossom Trail and sat down in the lobby with his luggage. Bank employees became concerned when they asked whether he needed help and all he would say was "I want to go to India," Jones said. Trooper Michael Ellis of the Florida Highway Patrol, who was writing a report in the parking lot, spoke with Singh until deputies arrived and decided to evacuate the building. "He refused to leave, and when he unbuttoned his shirt there was some sort of vest underneath," said Jones. "That kind of alarmed people." As the bank emptied, a force began to assemble that included more than 70 deputies, troopers and agents from the FBI, the Florida Department of Law Enforcement, the federal Bureau of Alcohol, Tobacco, Firearms and Explosives, the Border Patrol, Immigration and Customs Enforcement, and the sheriff's Crisis Management Team and Negotiating Team. Traffic on South Orange Blossom Trail and Sand Lake Road was diverted through nearby neighborhoods, causing a traffic jam. The Sheriff's Office sent a robot equipped with a microphone, speakers and video camera into the bank so negotiators could try to speak with Singh. Asked to empty his bags in view of the camera, Singh declined and refused to leave the lobby. Negotiations continued until shortly before 2 p.m. when a deputy drove up in a white Big Apple cab strung with Christmas lights and parked outside the bank on South Orange Blossom Trail. After Singh was taken into custody, deputies discovered that he carried an Indian passport. It was unclear how long he had been in Central Florida. He was driven to Sand Lake Hospital for treatment of dog bites before being jailed on charges of disorderly conduct and trespassing. "There's no reason to believe he has any mental issues," but he will be evaluated at the hospital, Jones said. "The bomb squad blew up his bags but there was nothing there except clothing." 2. "Kept shouting "Where is Ba-Boo, show me Ba-Boo" as they took him away to get his Green Card & Taxi Permit"
3. "Turban wrapped too tightly", and "Cop should've pointed to the dot on this guys head and said: "You are here!"" 4. "He should've just scratched off the red dot on his wife's head to see if he won one..............."
There are a bunch more that got my blood boiling, but then again, we can't blame these people for their lack of education. Sure it is entertaining for those that are not South Asian, but it wouldn't be as funny if stereotypical comments were voiced towards the commenter's back ground or ethnicity's. "floridatoday", might have screened their comments, but what's the point if their readership is blatantly ignorant. I hope that there is a Sikh organization that is assisting Nirvair Singh with his dilemma and that he isn't left in the hands of Orlando's, "finest". This should be ICE promo video! Thanks for this post. It's really sad to see the complete ignorance of Florida's law enforcement. Automatically assuming Mr. Singh had a bomb simply because the cops don't know the difference between Sikhs and Muslims is inexcusable. I also would question whether Mr. Singh even has any mental problems. For all we know he was simply confused about where to buy a plane ticket!